Tricia Spencer received the Best Nonfiction Book award for "Tips, The Server's Guide To Bringing Home The Bacon - The Customer Speaks!" from the Southwest Writers International Manuscript Competition. "Tips..." is available on Amazon.com and elsewhere and has become a training manual for restaurants and food servers around the country. Her short story, "Deviled Eggs," was a winner in both the L. Ron Hubbard Writers Of The Future Competition for Science Fiction and CrossQuarter Publishing's Paul B. Duquette Memorial Short Science Fiction Contest. "Deviled Eggs" is published in "CrossTime", the 2002 science fiction anthology featuring the winners of the CrossQuarter competition. Her short story, "Miracle Man," was a winner in the 2005 Cloak and Dagger Mystery Writing Contest where the finalists were judged by renowned mystery author Jeremiah Healy. And her short story, "Noses, Toes, and Elbows," was a winner in the 2005 Scribes Valley Publishing Short Story Competition and is published in that publisher's winners' collection, "They Do Exist." Another short story, "Empty Shoes," took top honors at Scribes Valley and appears in the 2009 anthology, "The Road to Elsewhere." Tricia's "Spirit Prayers for Joyful Living" is a Kindle exclusive. Her 2011 book, "The Touch of Roy and Dale: The Impact and Influence of Roy Rogers, The King of the Cowboys, and Dale Evans, The Queen of the West, As Only Their Fans Could Tell It," published by West Quest, is a unique fan-driven book about the indelible affect Roy and Dale had on the lives of their fans. "The Touch of Roy and Dale" was a 2012 USA Book News Award Finalist in the general biography category. It's available in both paperback and as an ebook, and part of the book's proceeds benefits Roy's and Dale's charity, The Happy Trails Children's Foundation. October 2012 brought the release of "1001 Wedding Ideas: The Ultimate Resource for Creating a Wedding No One Will Ever Forget", published by Sellers Publishing. This huge, 544-page tome is chocked full of wedding planning possibilities. 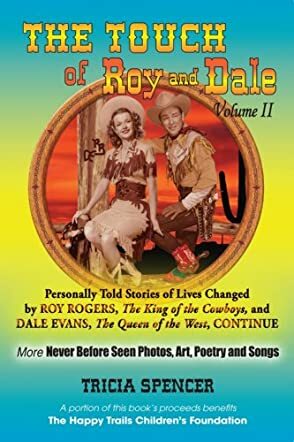 The Touch of Roy and Dale, Volume II: Personally Told Stories of Lives Changed by Roy Rogers, The King of the Cowboys, and Dale Evans, The Queen of the West, CONTINUE was released in 2014, completing the two-book Roy Rogers and Dale Evans, West Quest series. Like Volume I, part of the proceeds from the sale of this book benefit Roy's and Dale's charity, The Happy Trails Children's Foundation. Both Volume I and Volume II of The Touch of Roy and Dale were honored as 2014 Indie Excellence Book Awards finalists, as well as Reader's Favorite Book Awards finalists. A historical romance novel is on deck, and the launch of Tricia's unique, new wedding web site, "The Bridal Museum", will happen in 2015. Tricia is listed in "Who's Who of American Women", "Who's Who of Emerging Leaders", "Who's Who in The West", and "Who's Who in The World". Her life pursuits reflect her philosophy that variety is truly the spice of life. From food service to touring with the International Company of Up With People to creating and marketing her own line of wedding accessories to author, with a world of diverse creative pursuits in between, Tricia has reveled in the highs and lows of self evolution and in the myriad of endeavors life has to offer. Born and raised in Central Illinois, she and her husband, Mark, live in Southern California where they share their home with all manner of furry and feathered creatures. They also share a passion for the simple pleasures of life, like sharing a great meal or taking a drive through unknown territory. I love diversity, stretching for the stars and pursuing my dreams. Those dreams are constantly evolving, and I embrace them as they come. I hope everyone finds as much pleasure in their own pursuits as I find in mine. More than 100 years after their births, the road to Happy Trails still begins with Dale Evans, The Queen of the West, and Roy Rogers, The King of the Cowboys. What a tribute to this legendary couple of all times. “Spending summers working at the Roy Rogers and Dale Evans museum brought an unexpected pleasure,” says Dustin Rogers, grandson of Roy and Dale. Dustin goes on to say, “I got to personally hear the fans talk about how their lives were impacted by the two people I called Grandpa and Grandma.” In Volume II, The Touch of Roy and Dale, Tricia Spencer recalls the impact Roy and Dale had on the lives of their fans. Their fans were more like an extended family of millions. I didn’t think Ms. Spencer could top Volume One of The Touch of Roy and Dale, but Volume II is even more special because it tells more of the influence this very special couple had on the lives of their many fans. As I read the letters of fans in this book, I was touched by the heartwarming relationship Roy and Dale had with these fans. Their extended love clearly shows in what the fans say, as well as what members of their family have witnessed. This book is full of even more pictures, loads of information about Roy and Dale, film billboards, and so, so much more. You will just have to purchase a copy of this book for yourself to see what is included. I highly recommend The Touch of Roy and Dale Volume Two, and you can’t have this book unless you have The Touch of Roy and Dale Volume One. These are truly the best two books I have ever read about real-life people! !